There is no question that regular visits to your dentist for routine cleanings and preventive dental care are crucial to maintaining healthy teeth and gums and contributing to a healthy, radiant smile. Nonetheless, there are also a number of healthy habits you can perform at home daily to maintain the health and beauty of your smile by discouraging the growth of harmful bacteria that can cause tooth decay and lead to cavities, bad breath, and overall poor oral health. Brush thoroughly at least twice each day, using a soft nylon brush. Be sure to thoroughly brush every surface of each tooth, using a soft circular motion to loosen debris and bacteria that may become lodged in the natural cracks and crevices of each tooth. Floss daily in the morning and evening, making sure to reach the critical areas just beneath the gum line to dislodge food particles that contribute to the buildup of plaque and bacteria that contribute to tooth decay. Rinse your mouth thoroughly after eating or drinking if you are unable to brush. 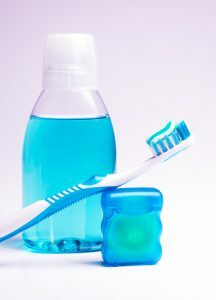 Using a mild, alcohol-free mouthwash is highly effective at eliminating odors as well as discouraging the growth of harmful bacteria in the mouth, but even rinsing with plain water will help to prevent food particles and acids from accumulating on the surface of your teeth and gums. Use toothpicks or dental picks to dislodge food particles that may become stuck in tooth crevices or the cracks between your teeth after you eat. We encourage our Monrovia-area patients to carry these at all times in case you happen to have a spontaneous snack somewhere where you are unable to rinse of brush afterwards. Chew sugarless gum sweetened with Xylitol, a natural sweetener that has been proven effective in contributing to the improved health and condition of gums and teeth. Xylitol helps your breath remain fresh and clean, while also discouraging the growth of harmful bacteria in the mouth and nourishing the health and strength of your teeth and gums. While chewing sugarless Xylitol gum is not an effective alternative to brushing, flossing and rinsing after every meal, many dentists recommend this daily habit to discourage harmful snacking of sugary foods between meals. If you are a California resident in Monrovia and are seeking a qualified, top-quality dentist who provides comprehensive dental care, including preventive care to keep your teeth and gums healthy and ward off the development of tooth decay and gum disease, consider Dr. Q Dental, where your oral health is our top priority. To learn more about how Dr. Q and her team can help you keep your gums and teeth in the best possible condition, contact our friendly office in Monrovia to schedule a consultation at (626) 599-9819.